previous sports vision assessment include, Football (Premiership), Cricket (ECB), Cycling (TdF) Baseball, Rugby (Premiership) Golf, Tennis, Motor Sports, Alpine Sports (including skiing, snowboarding, climbing) Track and Field Athleteics and many more. Often providing a bench marking and analysis of Key Performance Indicators for a specific sport based on 15 years of experience. Vision assessment/Screening at the team location. Bench marking against other athetes. Customised Sports Vision Correction or Training as required. Can include a squad and indivdual approach, often intergrating coaches in delivery and collaboration. Many sports require specici vision skills. Talent ID has been used for player selection and development in Olympic and Internation Sports Programmes. DSports are usually in a moving environment or a moving object. A simple eye test chart does not replicate this. Dynamic vision test are trequiered to test the movement pathways of the visual system. 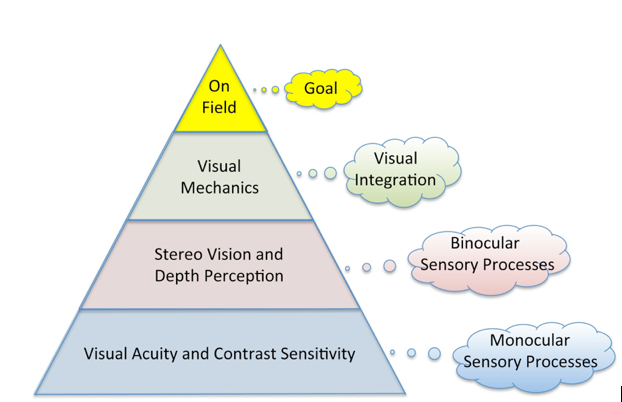 Sports Vision Institute has been at the forefront of technology regarding the role vision plays in Sporting performance. Often leading the way and testing products to ensure they have an evidence base to the value. All of these are based around atheletes and in many cases working with elite and world champions.